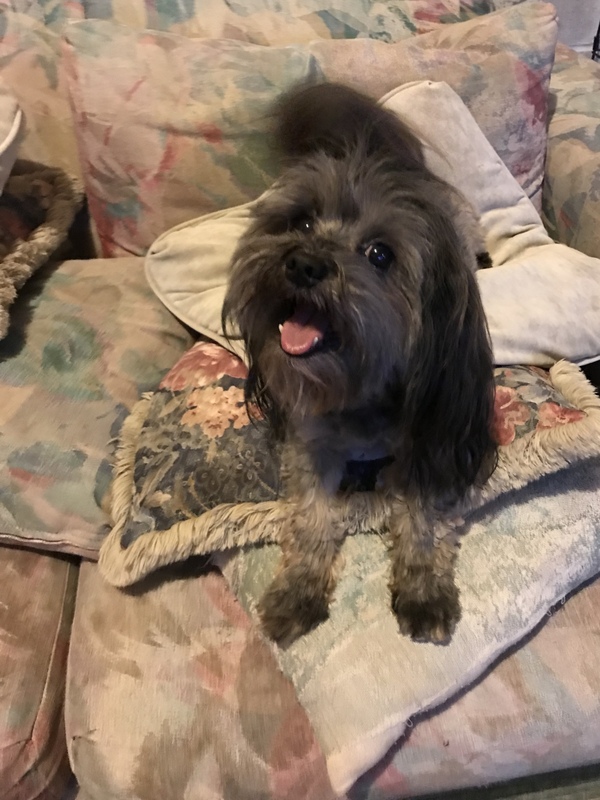 Listed below are the steps we take to groom our Havanese in full coat. When we started it would take us about an hour per dog. Now that we have more experience, it is closer to half an hour. We groom our dogs every 1-2 weeks so they stay smelling pretty and feeling so soft and silky. I can't stand a dirty dog. In the summer they get groomed more frequently, in the winter less. 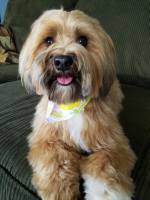 The more frequent they are groomed, the fewer tangles and matts you will have. Really, the difference between two and three weeks is amazing. Every time I wait three weeks I regret it. It takes me much longer and is much more difficult on me and the dogs. 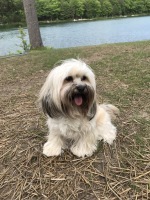 After a fishing trip your Havanese will probably need a good grooming!! 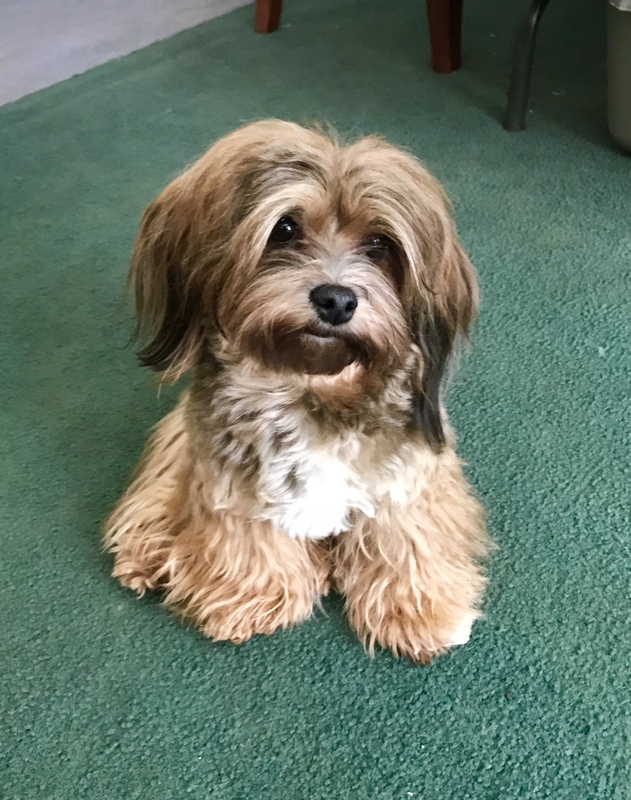 A Havanese can be expected to need to be groomed every week or two if kept in a full coat. From our experience, our dogs do well if they are groomed every two weeks. Their coat remains very nice and we have minimal problems with tangles. If you notice a tangle forming between baths, just take the comb in gently loosen it out. Never comb a silk coat dry. For between bath combings lightly mist the coat with a dilute conditioner. The steps below represent the steps we take when grooming our dogs. 1. Lightly mist the coat with dilute conditioner and gently comb (metal fine/med greyhound comb works well) the dog thoroughly. I prefer a comb since I feel a brush misses a lot. Start at the feet and continue to comb with downward strokes, working your way up the leg. Do this to both the front and hind leg, then in the same manner comb the shoulder, rump and body working your way from bottom to top. This assures no areas are missed. Repeat on opposite side. Comb the neck and chest in the same manner, then the head, ears, and tail. 2. Use a fine tooth comb or flea comb to comb the face. Wipe under the eyes with a wash cloth. Trim inner corner of eye if needed. 3. Remove ear hair and clean inner ear with ear cleaner. 4. Bathe dog using downward strokes, do not 'scrub' the hair back and forth, this causes matting. Wet coat, apply shampoo and work into coat using downward motion. Rinse well. Apply conditioner in same manner, rinse well. 5. Wrap in towel (do not scrub), let sit for 3-5 minutes holding dog or in crate. This helps to dry a little, making blow dry time shorter and easier. We do not let our dogs run around when wet. We found this increases tangles. 6. Spray your dog with dilute conditioner (10:1) all over generously. We also spray our dogs with Nurtogena Body Oil diluted in a spray bottle (20:1). Shake well before spraying on your dog and use only a light spray. Never use the oil spray on a dry coat or it will appear oily. If used after bathing before blow dry it does a good job conditioning the coat and leaves a nice shine without looking oily. 7. Comb out your dog repeating step 1 making certain to get all of the coat combed clear to the skin. Gently work out any tangles. Starting at the bottom, combing down systematically assures you are not missing the hair underneath. If you start combing at the top and work down you inevitably miss much of the coat. 8. Blow dry thoroughly. I do one side, then the other. Again, start low and work up. You can use hair clips to hold the hair out of your way if it is helpful. I blow dry in a similar manner to combing. Use the comb as you blow, combing the hair down. Do not blow randomly letting the coat blow all over, this can create tangles. Always blow down. You can use a hand held blow dryer made for people or invest in a nice stand dryer. We use a hand held but hope to acquire a stand dryer some day. 9. Trim pads and nails. The hair between the pads of the feet needs to be trimmed. It is easiest to trim it even with the pads. If you wish to do a more thorough job (I do), you must be careful of the webbing between the toes. After trimming the hair I clip the nails. Move on to the next foot until all four paws have been completed. 10. Lastly I take each paw, pull the hair down around the bottom edge, then cut all the hair even with the bottom of the paw. This keeps the hair off the ground and makes a neater appearance. Stand the dog on the table and cut any loose hairs that may have been missed around the feet. 10. Give your pup a treat, he deserves it!! Between bath brushings: We are not big fans of brushing our dogs between baths. We find that if we are faithful to fully bathe and groom our dogs at least every two weeks the need to do much in between is nearly eliminated. However, some people find brushing their dog to be relaxing and sometimes it is just necessary. In either event, make certain to never brush the coat dry, this will cause breakage. Lightly mist the coat with dilute conditioner (10:1) then use the Chris Christensen oval wooden brush and brush over your dog. Use the comb to loosen any tangles you may find. The light mist of conditioner will not only help prevent breakage, but will also give your dog a freshly bathed smell. Sometimes between baths we will skip the brushing and just mist the dogs with dilute conditioner because I like them to smell nice and fresh. Matts: Inevitably you will encounter a matt along the way. Our only dog who has NEVER had a matt or even a tangle is Harley (if only all his pups could get his lovely, easy care coat). Really, all our dogs have minimal matting, but it does occasionally occur. Usually this is due to my neglect. For small tangles and matts, I just lightly spray with dilute conditioner (mixed 10:1 with water). Then gently comb from the end of the hair back toward the skin, slowly separating the hairs as you go. BIG Matts: If you should really find you neglected your poor pooch and they have large matts, all is not lost. DO NOT WET OR DAMPEN THE COAT!!! Use corn starch liberally on the DRY matted area. Comb gently from the end of the hair back toward the skin systematically. It will take some time but you will be able to remove the matting with minimal hair loss or breakage and minimal complaint from you pooch. Add more corn starch as needed. I don't think you can add too much. Repeat this process for every matt. Once all the matts are removed, apply a light dusting of corn starch over the rest of the coat, comb thoroughly. Now, follow up with the normal bath routine. BIG Matts option 2: This requires you to get your dog completely groomed all in one setting! Do not even begin this process unless you can commit to finishing. This way you will not comb through the matts at all before bathing. Place the dog in the sink or tub and shampoo. Follow with conditioner. While the dog is wet and has conditioner on the coat, begin combing through the matts one at a time. Work from the end of the hair to the skin. It is a long, slow process, but you can get the matts out fairly easily, but it does take time. You can work in the sink or tub or take the dog and work on a grooming table or on your lap, but the dog must be wet with conditioner. Spray extra if needed. If necessary, you can drag the scissors from skin to end of hair through the matt. You will loose some coat, but it will separate the matt and make it easier to comb through. Do NOT cut the matt out, this will leave a hole in the coat. Continue to work from end to skin on all matts until your dog is matt free. Rinse well and blow dry. You MUST finish, or the matts will set and you will not be able to get them out. Once matts get wet and dry they are much harder to remove. So, if you can't do it all in one setting, use the dry method. Blowing coat: otherwise known as coat change. This happens usually sometime between 9 months and 2 years. The coat will change from puppy to adult and in the process the old puppy coat drops out into the coat and must be combed out or you will have a major matted mess on your hands. During the coat change it may require daily combings to avoid a tangled coat. This may take several weeks or months depending on the dog. Keeping the old dead hair combed out is the best way to avoid the tangles and matts that will occur if left on its own. 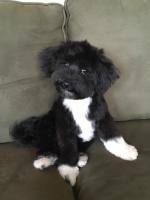 Puppy Cuts: An easier way to keep grooming needs down is to do a puppy cut. The body and legs can be cut down to 1-3 inches long, making grooming easier. 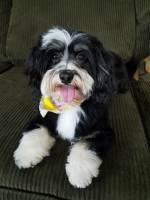 The head, tail, and ears can be left a little longer to keep the 'look' of the Havanese. Many people prefer this easy hair style. Combing is much quicker and easier on the shorter coat and so is blow dry time. It is still recommended that you groom your dog every 2 weeks, just to keep the coat free of debris and tangles. It has been our experience that no matter if your dog is in long coat or a puppy cut their hair and skin requires regular bathing. Bathing your dog/puppy every two weeks, and more often if outdoors and getting dirty, will help your dog have healthy skin and coat. We have been using Sprectrum 10 shampoo and conditioner for years and have found our dogs to always have very healthy skin and coat. Waiting longer between baths can cause dry skin and flaking from too much environmental buildup on their coat and skin. Clean is healthy, no matter the length. We have never had any skin issues from regular bathing and grooming, it has never caused irritation or dry skin. Always blow dry your dog. Allowing your dog to drip dry can cause skin irritations and promote fungus and yeast growth. It is well worth your time to keep your pup clean. 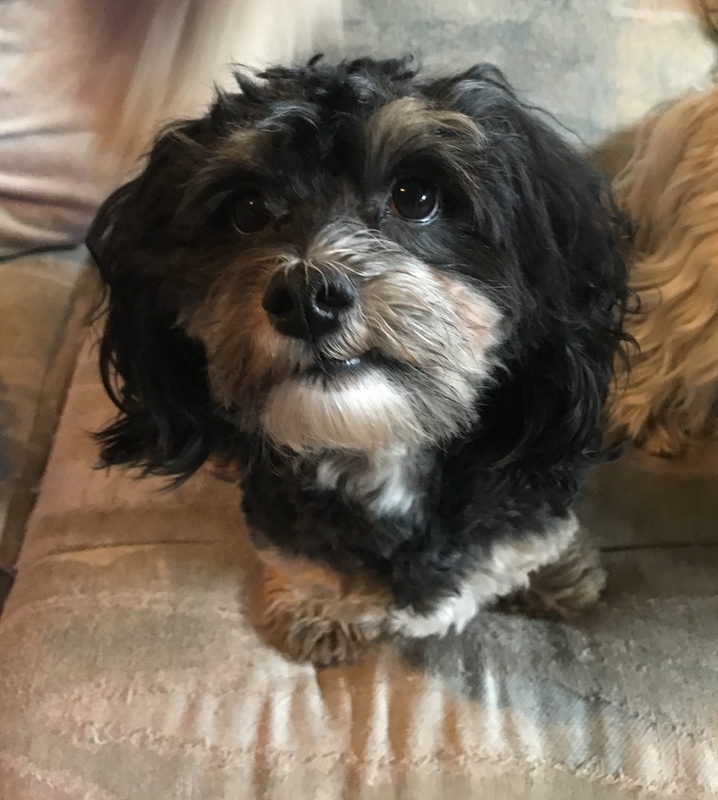 ​ Below are a few of our puppies in puppy cuts that will give you some ideas about how you may want to have your Havanese trimmed. I think they look adorable!